If you ever wondered what the Federal Election Commission does, for the last few years it’s pretty much been not much, if anything. That’s troubling to some and not others. Troubling to many because the agency is charged with being the referee when it comes to campaign finance. With a presidential election on the horizon the agency’s oversight of the millions raised and spent could play a factor in the race. Others say the agency’s inertia is just fine, that things should be obviously bad before the agency determines money was raised or spent in violation of federal election laws. You can have a bagel or a doughnut at the party because the commission couldn’t agree on which to provide. You think I’m kidding, don’t you. U.S. Rep. Derek Kilmer, D-Gig Harbor, takes the view that gridlock on the commission is hurting democracy. He introduced a bill, nabbing a couple of Republicans to join him that would make it easier for the commission to make a decision, something it hasn’t found easy to do for some time now. 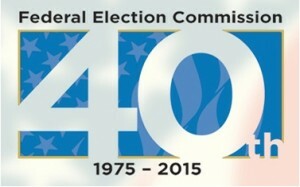 The FEC was created in 1975 as a response to the Watergate scandal. Election violation questions go to the commission. To prevent partisan decision-making on the oversight board Congress decided to have it made up of three from each of the two major parties. In the past the commission has been able to make decisions by breaking ties on a regular basis. Not so much lately. The commission has become so clearly divided that for a party celebrating the organization’s 40-year anniversary, commissioners could agree whether to sever bagels or doughnuts, according to a New York Times piece that goes to painful detail into how dysfunctional the commission is. Members compromised and provided both, a rare act of the commission actually accomplishing something. Kilmer would change that by changing the makeup of the commission to two from each party and one non-partisan representative. Finding a non-partisan is possible, and the concept appears to have worked with Washington’s Redistricting Commission. There is reason to suspect the bill won’t go far. Despite the appearance of two Republicans as cosponsors, party members generally are not inclined to do something to make the commission more active. The Times piece illustrates this. Republican members of the commission see no such crisis. They say they are comfortable with how things are working under the structure that gives each party three votes. No action at all, they say, is better than overly aggressive steps that could chill political speech. And a Time Magazine piece (Kilmer is quoted in the article.) detailing how the agency can’t even hire a lead attorney seems to make the same case that getting this to the President’s desk is going to be a tough sell. GovTrack.US gives the bill a 2 percent chance of becoming law.